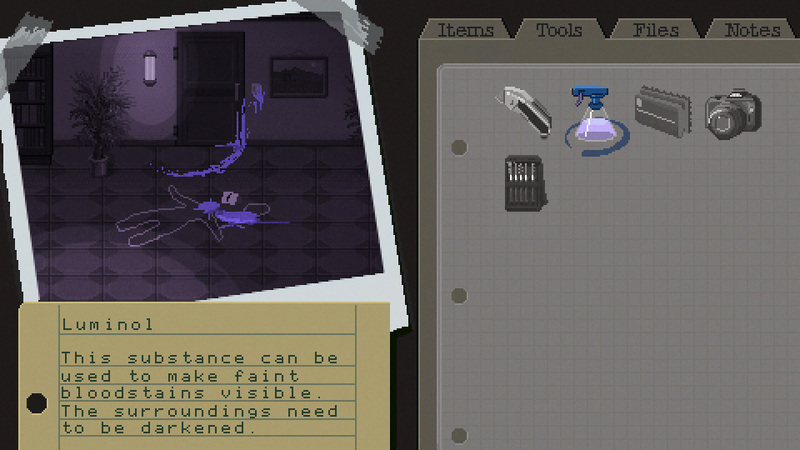 ◁ DO NOT CROSS ▷ is a game about the work of a forensic cleaner. 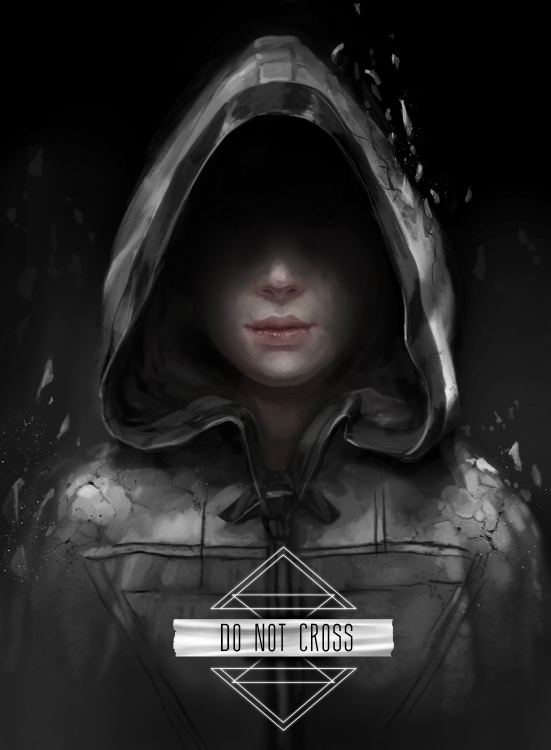 It's aimed to be slow paced single player game with a unique premise and dark atmosphere. 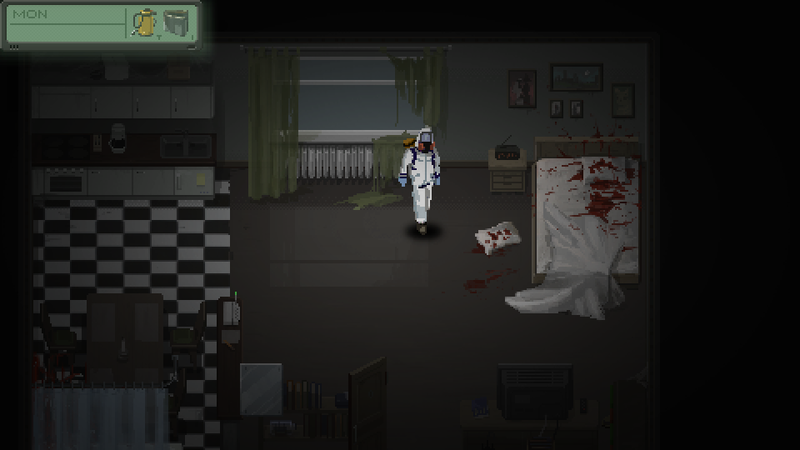 Your job is to clean up the aftermath of different crime scenes, which gives you the chance to look trough the belongings of the victims and learn more about their past. 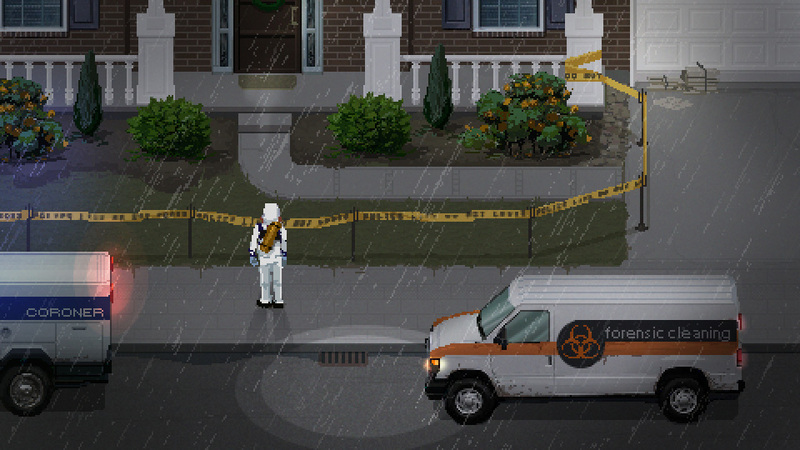 Most games you play feature a hero who is confronted with some problems he has to overcome. He sets out for a journey to fight his inner demons or external dangers to reach a happy end. It's a well established formula, but very few games dare to depart from this path. DNC is set out to head into a different direction. It will revolve around the downfall of the protagonist. He starts out as a rather normal individual. The more time he spends alone with his job the more he becomes fascinated by the dark subject matter. This development won't stay without consequences, and will be the central pillar of the story. 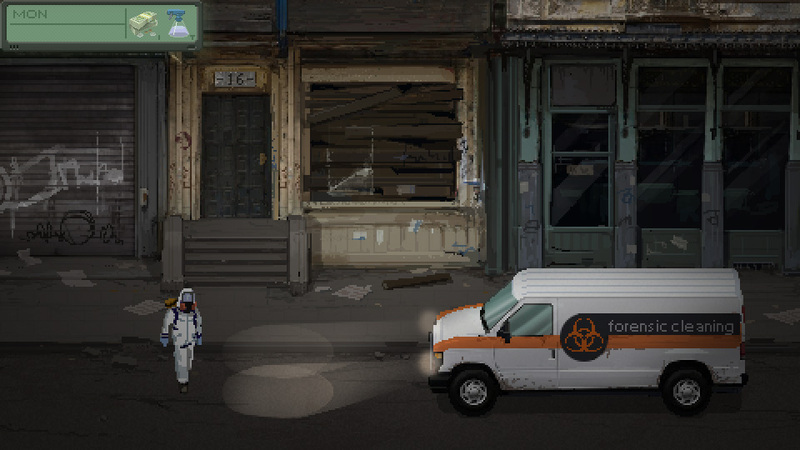 Or goal is to create a game with an melancholic atmosphere with an unique approach to storytelling. You'll spend a lot of time alone in the apartments of crime victims. This gives you the chance to find out more about them by looking through their personal belongings. It's an indirect approach to tell a story, but it offers a lot of freedom. 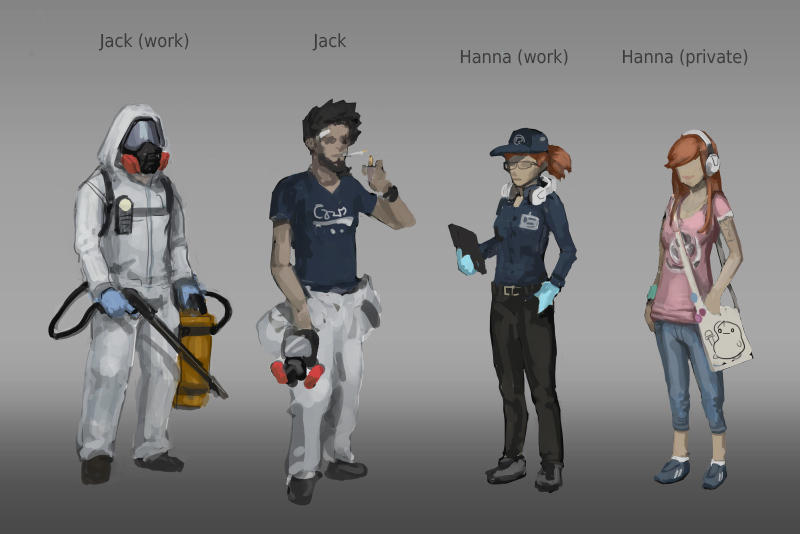 Only the cleanup will be mandatory, it's up to you to investigate and find out more. That's some fancy art you've got there. As for the art style looking too friendly, the only mockup that looks particularly "friendly" is the first one. And I think that's because the room doesn't look used at all - the walls are clean, the bookshelf is neat, the plans are undisturbed. 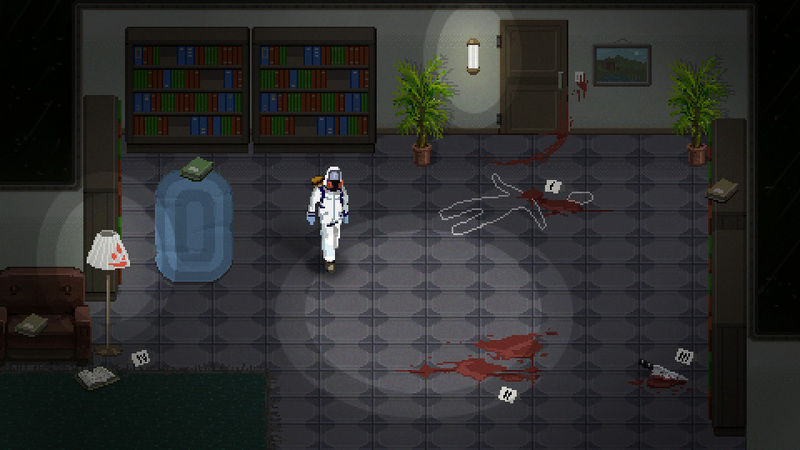 Aside from a few misplaced books (and of course the crime scene), everything looks very sanitary. This is in contrast to the picture of the dead man, where the room looks in disarray with spider webs and torn books & such. Yes! I love such games! 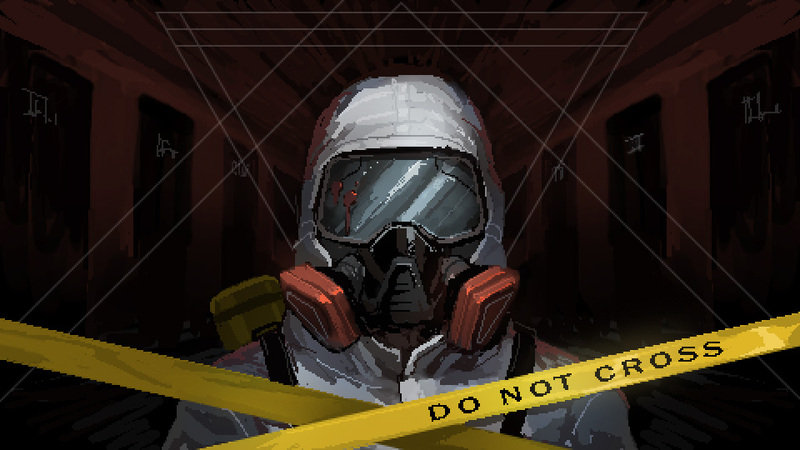 Although, there is a slight discrepancy in the fact that he's dressed like people dealing with contamination and the crime scenes look very regular and not dangerous. His costume is suitable for some vicious stuff. I'm having high hopes for this nonetheless. Nah, I don't think the art style is too friendly. Pretty dark and creepy already. Looks nice too. And interesting concept! very cool concept. the art looks appropriate to me but it's your game, do what you like. i recommend actually making the game before worrying about the "right" art style though. I agree with the previous comments. The art style looks great for now! Working on the gameplay seems like the main thing to focus on next. Also your images are just aching to be turned into gifs. Can't wait to see that! 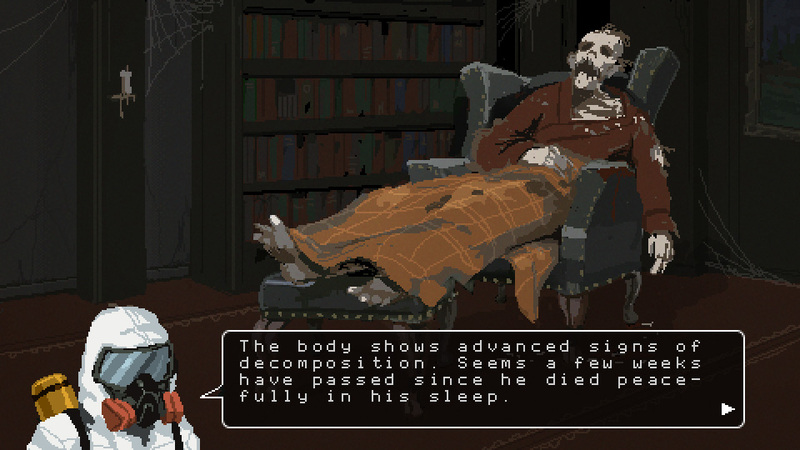 Also, the game gives me a sort of Professor Layton vibe but a spooky version. Gameplay would be totally different but the way that game navigates through scenes and how you interact with the environment could be a great place to start! This is a good point. Maybe if you wanted to keep the suit (I really like it...) you could add in some subplot about the protagonist being germophobic/OCD and tie it into the "troubled protagonist" you mentioned. I, alongside everyone else here it seems (heheh), really love the art. It's smooth, yet pixelated. Very nicely done! Great concept, the art looks amazing. Love the artwork I'm seeing. Kind of a throwback style but VERY well done! Love to see some animated game action too! Has a very interesting art style going to be interesting to see more of the game latter on. My name is Alex Gwartney I am currently a college student attending online classes at University of Phoenix. I am pursuing my associates degree in computer science with a concentration in Software Development. ahh this looks really cool! I think if you kept the same art content, but used deeper, darker shadows it would feel less happy. The screens I see might be a bit too bright if you're going for a more somber tone. I found on my last game that it's tough to balance between a level of darkness that conveys right mood but still allows players to easily see. This sounds awesome Zero, can't wait to see more! This looks very interesting, and I love the art style. I'm excited to see how it turns out! Just a note, if I may. The art style seems fairly consistent, but one thing that stands out to me are the lights. They are pretty much just ovals on every object. 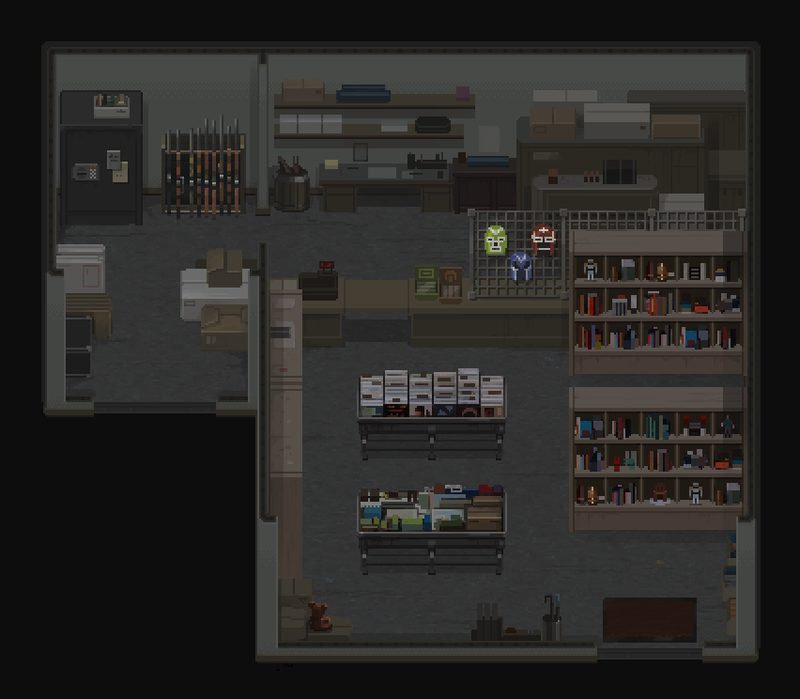 But your art style is very detailed, and precise, and with the lighting like that, it's rather jarring. For example, in the last image, the forensic cleaning vehicle looks like a pixel-perfect representation of an actual vehicle. 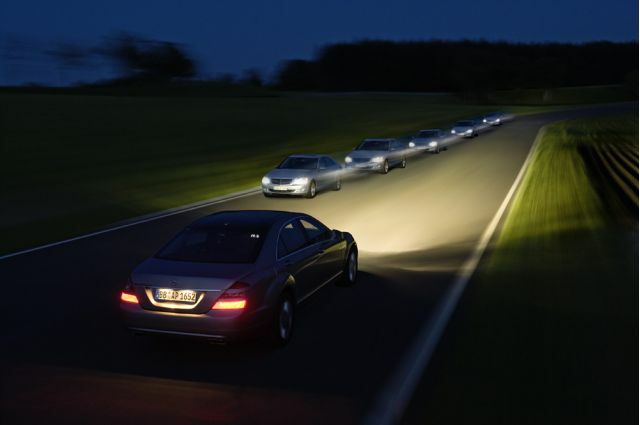 But a real vehicle's headlights are going to interact differently with the environment. Especially considering there are two headlights, the light wouldn't just be a single oval in front of the vehicle. at the moment, but the whole artstyle is a bit too friendly. As far as this goes, I might suggest adding some wear and tear to the environments. A scuffed tile here, some paint peeling there, maybe a stain on the rug - just something to show that the rooms are more than a bunch of tiles. Thanks for the detailed feedback. I changed the car lights how you suggested. They still need to fade out a bit better, but I have to fix a lot of other things first ^^. Also worked on the menu to establish a look for the different options and coded some basis functionality for the items/tools. Actually I really like your idea. It's really unique, but it still works as a game we can all understand. I think your mockups on are spot on. You need to write an article on how to make mockups because I honestly thought it was just screenshots for your game. If your on twitter please reach out to me, I'd love to keep in touch. You got a cool atmosphere and idea going on. Tracking.